On June 29, four experts from the United States Institute of Peace discussed the current situation in Iraq and examples of reconciliation in ISIS-cleared areas. The briefing also discussed similar preparatory efforts for Ramadi and Mosul post liberation. The panelists shared their experiences in building local peace in Iraq during the past 10 years and their analysis of the issues Iraq faces today, including ISIS and continued political instability fueled by sectarianism and corruption. A question-and-answer session will follow the panelists’ presentation. Mr. al-Jarba is one the key civil society and tribal leaders promoting peacebuilding in Nineveh Province today. He is also founder and chairman of Al-Tahreer Association for Development, one of two civil society organizations chosen by the Iraqi PM’s office to join the Government of Iraq’s interagency planning and crisis team in Nineveh. Trained by the U.S. Institute of Peace (USIP), Al-Jarba is a prominent trainer and conflict management facilitator and has played a critical role in many of its peacebuilding initiatives. The U.S. Embassy, U.S military, the United Nations, the Iraqi military, and other actors have sought his expertise and involvement in resolving conflicts and building peace in areas around the country. Notably, al-Jarba played a critical mediation role between tribal leaders in order to mitigate conflict between Sunni and Shia tribes after the 2014 massacre of 1,700 cadets by ISIL at Camp Speicher near Tikrit. He also facilitated dialogue and mediated between the Christian and Shabak minorities in the Nineveh Plain, an area on the brink of violence in 2012. Throughout his career he has developed strong networks through his work with figures from the Provincial Council of Nineveh, the Prime Minister’s Office, the Iraqi Parliament, and tribal leaders from various regions in Iraq, as well as figures from international organizations who have taken part in conflict management and national reconciliation efforts. al-Jarba has also trained civil society activists in Tunisia and Libya on peacebuilding and conflict resolution. Dr. al-Mosawi is a member in the Network of Iraqi Facilitators and has wide experience in dialogue facilitation and conflict management in Karbala. Notably, Dr. al-Mosawi played a critical mediation role between tribal leaders in order to mitigate conflict between Sunni and Shia tribes after the 2014 massacre of 1,700 cadets by ISIL at Camp Speicher near Tikrit. A civil society and academic leader in Karbala, he holds a PhD in Administration and Economics and is currently a faculty leader in the research and development department at the University of Karbala. He is the author of three books which focus mainly on economic development in Iraq. Mr. Hamasaeed is a senior program officer for the Middle-East and North Africa Programs at the U.S. Institute of Peace (USIP). He joined USIP in February 2011 and works on program management, organizational development, and monitoring and evaluation. He also provides political and policy analysis on Iraq to USIP, and other peacebuilding actors. He has written on Iraq, and gave interviews to the international media on issues related to peace and conflict resolution in the country. Hamasaeed has more than ten years of strategy, management, and monitoring and evaluation experience in governmental, nongovernmental, private sector, and media organizations. Mr. Hamaseed served as a Deputy Director General at the Council of Ministers of the Kurdistan Regional Government of Iraq (2008-2009). Mr. Gharizi is a program officer for Middle East & Africa Programs. He joined USIP as program officer for Learning and Evaluation in August 2013. He previously worked at the International Republican Institute (IRI) where he designed, managed and evaluated programs on governance, political party and civil society strengthening, and election observation. His time at IRI included directing survey research programs in Lebanon, managing monitoring and evaluation efforts in Egypt and leading IRI’s long-term election observation for the 2012 parliamentary elections in Georgia. He also worked on projects in Oman, Morocco and Jordan. Prior to IRI, Osama worked for Transparency International’s chapter in Lebanon, the Lebanese Transparency Association. He holds a Master of International Affairs from Columbia University’s School of International and Public Affairs, with a concentration in economic and political development. 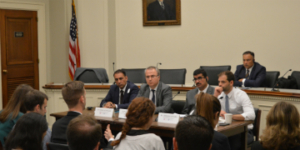 This was the 30th event in the USIP/PSA Congressional Briefing Series – Topics on International Conflict Resolution and Prevention, an educational program designed to provide congressional staff with opportunities to engage leading experts and fellow Capitol Hill staffers in bipartisan forums. The program aims to build cross-party relationships, encourage bipartisan dialogue, and equip staff with new perspectives on critical issues in international conflict, resolution and prevention.